Destiny's Dawning update has now arrived on both Xbox One and PS4 and besides including a huge list of improvements, new gear and activities, the update also includes a few secret items, one of which is known as Lysander's Cry. 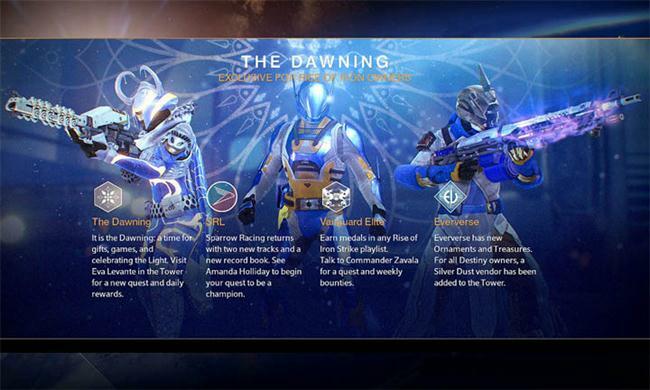 At face value, the Dawning update comes bundled with multiple new quests that are available from Eva Levante, Amanda Holliday, and Commander Zavala in the Tower. An updated Record Book offering new rewards for the winter holiday season along with a collection of new treasures from Eververse known as "Treasures of the Dawning". One of the most notable additions in The Dawning is the return of a particular timed activity that we last saw at the end of 2015: Sparrow Racing is Destiny's take on a competitive racing activity and with the Dawning update we get two brand new tracks to complete on, as we work towards a greater rank and new rewards. 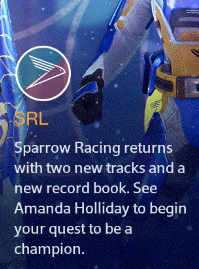 As I'm sure most will know, Sparrow Racing (SRL) can be launched from the Weekly Featured playlist in the director. Standard rewards can be claimed by leveling up your SRL rank with Holiday (shown below) but the secret sparrow is obtained by other means, shown at the end of this post. The following rewards can be earned by levelling up SRL through various Amanda bounties. Note: the Dawning update has reset every players SRL Reputation which should now be Rank 0. Let's now take a closer look at the sparrow in question. Appearing rather sneakily in the inventory section of the Grimoire, the Lysanders Cry sparrow was purposely hidden and although remaining a mystery at first, we now understand how to get it. Some of you may also remember the Dawnchaser sparrow which also appeared briefly when the first SRL activity launched. 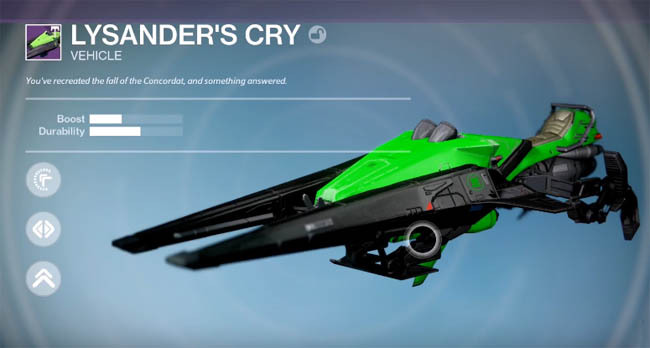 Note: Lysander's Cry is identified as an exotic sparrow in the database but is in fact a legendary vehicle in-game. 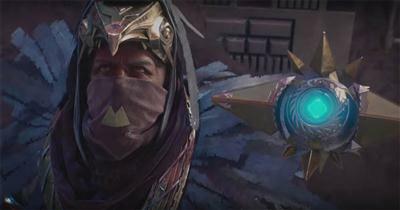 "Each Guardian wants something: greater speed, a rare weapon, a secret. Learn what it is. Use it." According to the Hidden, in the wilderness beyond the City, Lysander rallies his supporters and plots his return. Some whisper of sympathizers in the Tower and hidden gifts for Guardians who honor him. From a Grimoire perspective, Lysander was the leader of an old faction known as the Concordat. They were removed from the City Consensus and replaced with the Future War Cult. Further explanations as to why and how the Concordat were removed are revealed in the Gjallarhorn quest. 1. Dead ghost - it's in the Bannerfall Crucible map, on the concordat side (Fist banners) in the building up against the back side. Look directly across from special on the green banner side, it's behind a shelf. 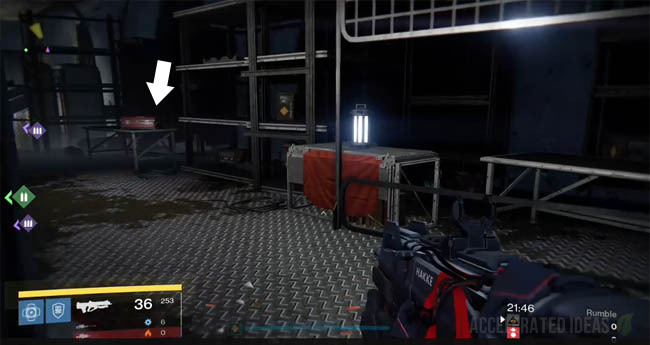 This ghost can be retrieved in private matches. 2. Treasure Box - in the Tower Hanger, find the treasure box at the back of the hanger right below the Future Warcult area. Once you open the treasure box, the Legendary trick sparrow "Lysander's Cry" is given as a reward.